I'm a bit of a sucker for a quiz of any sort, so it's no surprise that I succumbed to Deborah Needleman's style quiz. In all honesty, I wasn't sure it would reveal anything relevant, as there were a lot instances when I wanted to answer "none of the above" + I sort of raced through it. You keep up with culture, style, and trends, but have an appreciation for timeless forms and simple lines. You value good design, quality craftsmanship, and prefer the streamlined to the overly embellished or cluttered. You also appreciate the warmth and individuality of natural materials and handcrafted things and are inspired by colors and forms from nature... You love mixing up different textures... Your style is grounded and solid, not flighty or frilly.You value creativity. Your home can be happy and lively and the place all of your friends want to be. I am loving that second image. Hello dream dining room. Off to take the quiz! OK. I am an "Earthy Modern" gal too. Who knew. love the images in your post. I was labeled "Earthy Modern" too. I think it's pretty accurate considering the small number of questions asked. Thanks for the link! I'm going to share it on my blog as well! I've been obsessed with the fireplace in the top image for the longest time! I'm earthy casual, and I think that's pretty accurate, actually! Very cool! Me too, Earthy Modern! No surprise we're the same since I always love everything you say you love! Though I think you might be more earthy and me more modern--I fear too much texture and have no idea how to mix stuff. Fun quiz! I got Elegant Classic, which seems very accurate, although there were several questions where I was debating between two so I wonder how it would have changed the results if I had picked a different one. Beautiful images you chose to go with your results, too. And glad to hear you had a fun and relaxing trip by the by! I'm into anything that is light breezy and airy. Wonder what I would be classified as? Earthy Casual was spot on for me. The biggest challenge in my home is lack of space and bringing in only things I am truely in love with and have home for helps keep it simple and uncluttered. Ha ha! I just gave in and took it and I'm earthy modern too! i have loved that ione skye room forever too. 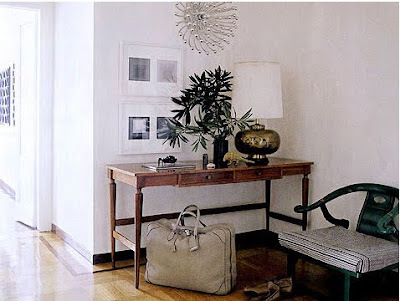 love earthy modern. I got Elegant classic: my biggest challenge is ORGANIZATION. They got that right! Thanks for the fun quiz! Have a great weekend! I love quizzes! I got Country Casual, which I guess is pretty close, but I wouldn't say it's right on. Like you, I think there were several that I wish I could have said "none of the above!" Well, I took it and I'm not sure about the outcome, either... There were too many instances where the only possible answer for me would have been "none of the above." Truly. But what a fun post! I am sooo loving these pics! I want to curl up on the rug near the fireplace with a good book and some coffee. What a perfect way to spend the day! at first i thought the quiz was bogus. i wanted to answer none-of-the-above as well to many of the questions. but,it pegged me as glamorous classic which is pretty spot on. 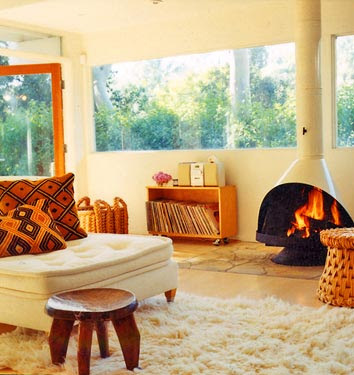 i love Ione Skye's place - it's one of my fave-ever domino shoots. My style is bohemian classic which doesn't sound like me in title, but when i read it all, it's pretty accurate. especially the colour palette and being scared of colour! plus, i was pleased to see i had the same as deborah needleman - love the pics i've seen of her place! glamorous classic for me. not sure if i agree with my color palette, but i sure like the description! that was fun! I got Dramatic Modern. Pretty accurate i'd say. I did a post inspired by the result. It was fun looking for images. Fabulous photo from Ione Skye's house. It is the ultimate hip and modern, yet comfy California tree house as you look out those windows! That Ione Skye spread is my all time favorite too. I really miss Domino! I like how bright the rooms are! 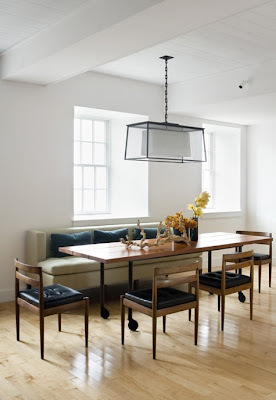 loving everything about that dining set up. the light fixture especially. saw one very similar to that in the latest restoration hardware catalog, surprisingly enough.